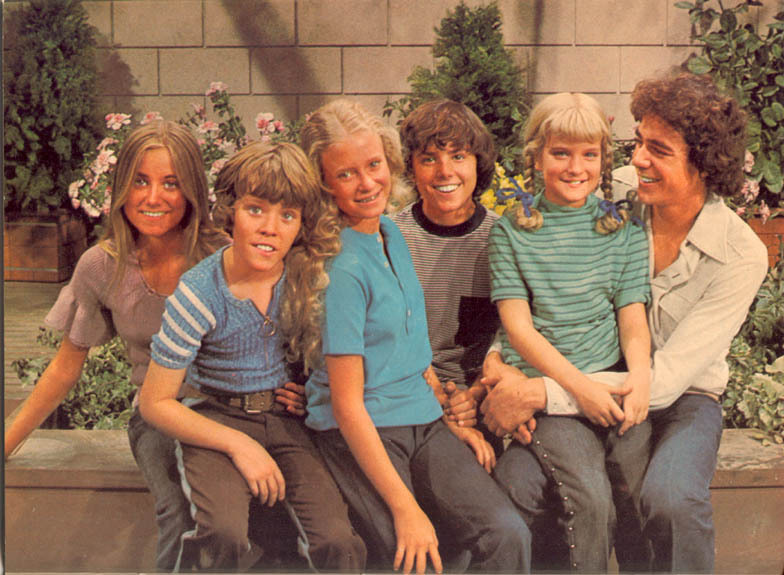 Mike and Carol Brady are the worst parents in the history of the world, part II. Upon further consideration, I have decided that perhaps Mike and Carol Brady are not the worst parents in the history of the world. But, they are bad. The “family values” that they try to instill in the Brady 6 (does anyone else use this term to describe the Brady mafia…I mean gang…I mean darling children?) are downright disturbing if you stop and actually think critically about them. Let’s trouble the Brady family values together, shall we? In an era in which situation comedies emphasized how social climes were changing, The Brady Bunch was one of the few series that hearkened back to the traditional family values seen in such sitcoms as Leave It to Beaver and Father Knows Best. So, if this is the case and The Brady Bunch really does reflect traditional family values, what does that mean? According to the MBC, traditional family values include ignorance as innocence, a refusal to address changing social climes, and hypocrisy. Unlike All in the Family or even Julia, The Brady Bunch tried to steer clear of the political and social issues of the day. Rarely were non-white characters introduced into the series. Women’s liberation and gender equality were boiled down to brother-sister in-fighting. The counterculture of the 1960s was represented in random minor characters portrayed as buffoons–or in Greg trying to impress a girl with hippie jargon.The representation of childhood in the series as a time of blissful innocence was in marked contrast to what was happening off camera. Many of the boys and girls playing the Brady children dated each other secretly, making out in their trailers or in the doghouse of the Brady’s pet, Tiger. Oldest boy Barry Williams attempted to date Florence Henderson and filmed at least one episode while high on marijuana. All these incidents (as well as Robert Reed’s homosexuality) occurred behind closed doors, coming to light only a decade after the series originally aired. Mimi Marinucci, who has written an excellent article, “Television, Generation X, and Third-wave Feminism: A Contextual Analysis of the Brady Bunch,” offers one more family value to the list: sexism repackaged as equality. She writes: “Because the sexist messages of The Brady Bunch were often hidden beneath an egalitarian facade, however, our dismissive attitude left us vulnerable to the show’s subtly sexist subtext” (512). Marinucci’s analysis of the show (and Gen X’s/3rd wave feminists’ irony and sarcasm) is helpful in providing a deeper look at The Brady Bunch that includes more than the simplistic notion that the Bradys ignored social issues and presented family life as wholesome, white, and insular (which is the charge that the MBC is leveling against it). Here is my take on all of this: The family values that Mike and Carol live by are not merely bad because they are hopelessly naive, outdated or disingenuous. They are bad because they help foster a world view that is unjust. They encourage kids to gang up on each other or at least look the other way when the kids are “othering” each other. They equate truth telling and honesty with tattling and squealing. They discourage personal achievement and individuality by teaching kids that being good at something leads to selfishness, becoming too-full-of-yourself, and disloyalty. And, most troubling for me, they have created a family that demands conformity, uniformity, and togetherness and that shames and ostracizes any family member that dares to think different/ly (an Apple family this is not). It is because of their promotion of these family values that Mike and Carol are bad (as in not good, not just, not morally/ethically responsible) parents. Now, don’t worry, I have much more to say about these values and the Bradys. Look for future entries on the joys of conformity and group think (Jan, the only child), how getting along is more important than ensuring that everyone is treated justly (Kitty Carry-All is missing), why being the star only leads to a big head and sisters and brothers who don’t like you (Juliet is the Sun), and how privacy and the desire for a “room of one’s own” smacks of disloyalty (Jan, the only child). Okay, this is too much fun. I love critically dissecting the Bradys (almost as much as I love watching the show). I didn’t realize that the Brady kids had also starred as the Oompa Loompas in Willy Wonka and the Chocolate Factory. Next Next post: Trouble = worry = more insurance?